10% hyperDENT Anniversary Rebate at the IDS 2019! We truly have a reason to celebrate this year! FOLLOW-ME! was founded in 2007 and successfully entered the market with the first hyperDENT version in 2009. In only 10 years, the FOLLOW-ME! Team has made the hyperDENT CAM solution the world’s leading software system in the dental market. 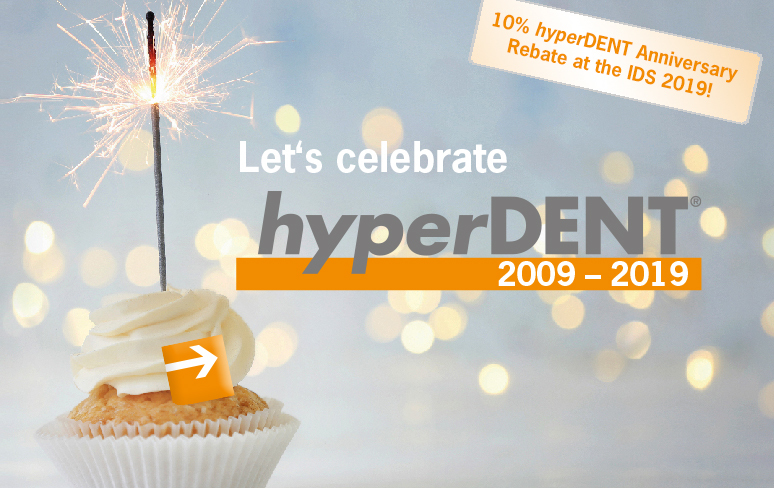 For hyperDENT’s 10th anniversary, we offer you a one-time 10% rebate on the entire hyperDENT product range. This one-time offer is only valid for transactions closed directly at our IDS stand (Stand J 10, Hall 3.1). You are here: FOLLOW-ME! Technology Group > EU_News > 10% hyperDENT Anniversary Rebate at the IDS 2019!